The Church’s North America Northwest Area covers territory ranging from the farmlands of Idaho, where Latter-day Saints make up almost 30 percent of the population, to the cold, rugged stretches of Alaska, where isolated Latter-day Saint families sometimes hold Church meetings alone. For an update about the Church in Alaska, British Columbia, Idaho, Oregon, Washington, and the Yukon Territory, the Ensign spoke with Elder Glenn L. Pace of the Seventy, North America Northwest Area President, and his counselors, Elder Wm. 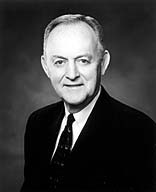 Rolfe Kerr of the Seventy and Elder C. Scott Grow, an Area Authority. Question: Could you tell us about the Church in Alaska and the Yukon Territory, which both border on the Arctic Ocean? Answer: Alaska and the Yukon Territory comprise a vast, beautiful area that inspires a deep respect for nature. To give a perspective of distance, it is as far from Boise, Idaho, to Anchorage, Alaska, as it is from Boise to New York City. Traveling through this cold land, it is not uncommon to see moose, eagles, and large flocks of geese. During the extremes of the northern winter, darkness can last for 20 continuous hours. Also, some locations are accessible only by plane. Consequently, a few of the Church’s meetinghouses have been specially designed for arctic conditions. In fact, at the dedication of one meetinghouse, local leaders had to delay the proceedings for about an hour until a polar bear left the premises. Even in Anchorage, a modern city of more than a quarter million, a member of a stake presidency recently told of a potentially dangerous bear being shot within a block of his house. Members willingly sacrifice and make extra efforts to meet challenges. For example, leaders in the Anchorage Alaska Bush District, which has seven remote branches, do much of their ministering by phone and mail. Alaska has about 24,000 members organized into six stakes, the newest of which is the Juneau Alaska Stake. Much of that new stake’s populated area is separated by water, necessitating the use of ferries and planes. At high council meetings, distant councilors participate via telephone. A recent stake conference was held by hooking up farflung meetinghouses electronically. The Juneau stake includes the Whitehorse Branch, the sparsely populated Yukon Territory’s only Church unit. Q: What about the Church in the area’s lower states and provinces? A: Listeners were told at a recent regional conference attended by President Gordon B. Hinckley in Eugene, Oregon, that the Church is now the second-largest religious denomination in the state of Oregon. One of Oregon’s two U.S. senators, Gordon Smith, a Latter-day Saint, was recently elected. Although the average person on the street might still have some misconceptions about Latter-day Saints, the Church is coming out of obscurity more and more each day. We have 327,000 members in Idaho, who represent 27.8 percent of the state’s total population; 126,000 members in Oregon, representing 4 percent; 211,000 in Washington, 3.8 percent; and 26,000 in British Columbia, 0.7 percent. In many ways, these proportions of members in the general population make for an ideal situation. There are enough Latter-day Saints that quite a large community of members can interact and flourish, yet huge opportunities for missionary work exist. The majority of persons who live in our area are probably acquainted through work, school, or the community with a Latter-day Saint from whose example they can benefit. Even in locations where Latter-day Saints represent only about 4 percent of the population, this still represents about 80 members in a high school of 2,000, for example. Thus it is inspiring to see that over and over again the outstanding Latter-day Saint youth of the Northwest demonstrate success in school leadership and accomplishments far out of proportion to their numbers. The Church in the Northwest is blessed by the participation of members from many different ethnic backgrounds. Some missionaries in each of the area’s nine missions are assigned to speak foreign languages, of which more than a dozen are spoken by members in the area. The area has 28 Spanish-speaking units and several Asian and Polynesian units, particularly in Portland, Seattle, and Vancouver. All members are greatly strengthened by having the opportunity to attend temples in Seattle, Portland, Boise, and Idaho Falls. The growth that has occurred in recent decades in the Northwest highlights interesting patterns in the Church’s overall development. The area has about 190 stakes, which is how many stakes the entire Church had in 1951, when David O. McKay was President. The area has about 700,000 members, which is how many members the entire Church had in 1932, when Heber J. Grant was President. Today, in proportion to the number of members, there are fewer General Authorities available to supervise and direct the affairs of the Church, which means that the role of local leaders has become more important. As the Church continues to grow, stake and district presidents and bishops and branch presidents have an ever-increasing responsibility to lead their units with inspiration. We are very impressed with the calibre of leadership in the Northwest. When organizing stakes, we are constantly impressed with the wealth of leadership with which this area has been blessed. We are also impressed with the spiritual depth of the sisters in the Northwest. What they are doing in Relief Society, Young Women, and Primary and in their own homes is wonderful. Their talents, abilities, and commitment to the gospel are just thrilling. Q: What kinds of efforts and initiatives are going forth among Northwest members? A: Members here are focusing on the same things as members all over the Church: leadership training, the proclamation on the family issued by the First Presidency and the Quorum of the Twelve Apostles (see Ensign, Nov. 1995, 102), and the balanced effort between missionaries and members. President Hinckley’s talk in the October 1996 general conference titled “Reach with a Rescuing Hand” has had much influence on members in this area. “We have some of our own who cry out in pain and suffering and loneliness and fear,” he said. “Ours is a great and solemn duty to reach out and help them, to lift them, to feed them if they are hungry, to nurture their spirits if they thirst for truth and righteousness” (Ensign, Nov. 1996, 86). Recently members of the Area Presidency have been issuing challenges in stake conferences for local leaders to personally go out and rescue a member or family stranded in transgression or disaffection. Often in the Church we talk about numbers and needs, but a person has to interface with another person before anything can be accomplished. An elders quorum president we heard of took the challenge to heart and started visiting elders in his ward with the intent to rescue somebody. One family he contacted has set a date to be sealed in the temple. If each member and leader would do likewise, the Church would see great progress in retention of new converts and activation of those who have slipped away. We are seeing marvelous manifestations of the wisdom of the Brethren’s decision to embrace the institute program rather than establishing more Latter-day Saint colleges and universities around the world. Student wards and stakes are growing fast, and enrollment in institute classes has tripled in some areas in recent years. Latter-day Saints who study at the world’s institutions of higher learning have great opportunities to be an influence for good. They can also be a great strength to one another, as in Boise, where young adults are making a concerted effort to identify and reach out personally to the lost sheep among them. As we go to conferences and mingle with the members of the Northwest, we are impressed with their depth of commitment and willingness to sacrifice and do what the Lord would have them do. In many of the stakes we visit, members wonder when they will have a temple in their midst, which is a healthy desire. We sense the same spirit of dedicated gospel living in the remote branches of Alaska, where only two or three families might meet together, as we do in places where many members can easily get together. The atmosphere in the Northwest is one of good people getting better as they live and share the gospel.